In Yiwu international trade city, there are more than 20 shops that ONLY specialized in selling manicure sets. Most of their factories are located in Guangdong province, since Yangjiang city in Guangdong is famous for the cheap and good quality stainless steel tools. But you don't necessarily need to go to Yangjiang because most probably, the quotes from these Yiwu showrooms are better than what you can get from the factory. AND MOQ is smaller than factory. For most manicure sets, they contain 6 pieces or more. There are nail file, nail clipper, ear pick, eyebrow clip and scissors inside. For nail clipper, normally has 2 pieces in different shape. For the beauty tools inside, there are two material, stainless steel and galvanized iron. Obviously, the price for stainless steel are expensive than galvanized iron. For example, the same set of tools, the price difference for steel and iron is around 1 rmb. Also, we can distinguish the steel and iron from the outside, iron is more glossy and steel is darker. The price for this manicure set of galvanized with PVC fabric is $0.9. 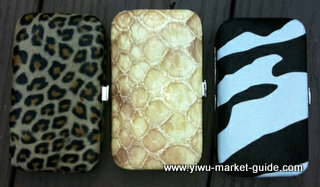 The same case with stainless steel tool also with PVC fabric, the price will be $1.06. 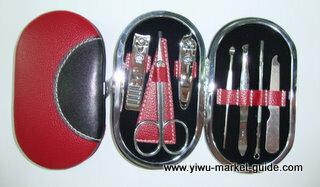 Buying manicure set in yiwu market, you also can choose the outside fabric, PU, PVC, even real leather, you also can select the design and shape. PU fabric is softer and thicker than PVC fabric, normally, the case with PU, the price is about 0.5rmb more than the PVC fabric.. The price for this PU case with galvanized tools as picture 2 is $0.94. Also many other shape of the cases you can choose, but the price will much more higher. The price for this manicure kit is $1.05. Use this circle case, with the same 6pcs tools above, the price is $1. The MOQ for one design is about 600sets if the fabric you choose have stock, if don’t have stock, and then you have to order about 1000sets.